My popular Herbal Remedies for the Home course starts next week, but with a twist!… It’s in the morning to enable homeschoolers, shiftworkers and others who can’t attend an evening course to get to know their herbs! 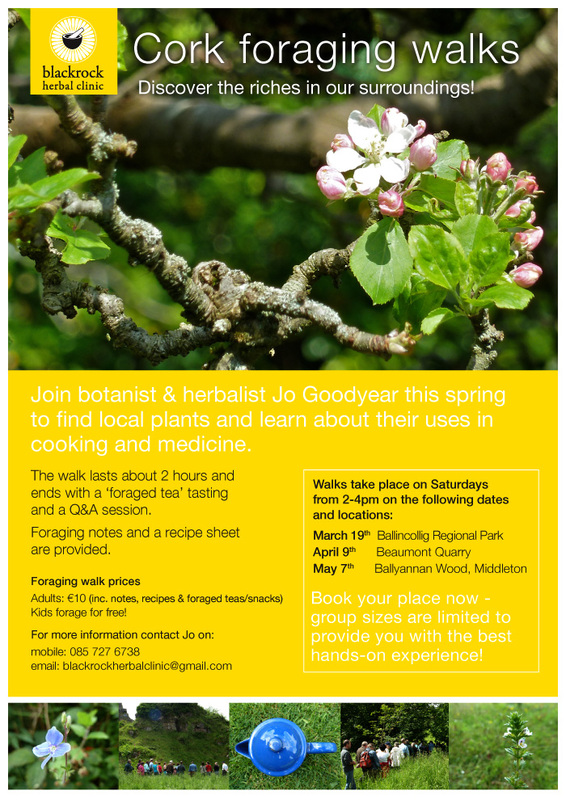 We’ll learn about 40 herbs, meet a lot of them on herb walks in my garden and learn how to make a range of herbal remedies to treat common problems. You’ll come home with a reference book, herbal teas and medicines that we’ve made every week and have a lot of fun in the process! Please get in touch by phone or email if you are interested in attending this course. I limit the numbers to improve each persons experience, so book ahead! Spring is the best time to get to know plants as they are springing up all over my herb garden right now! 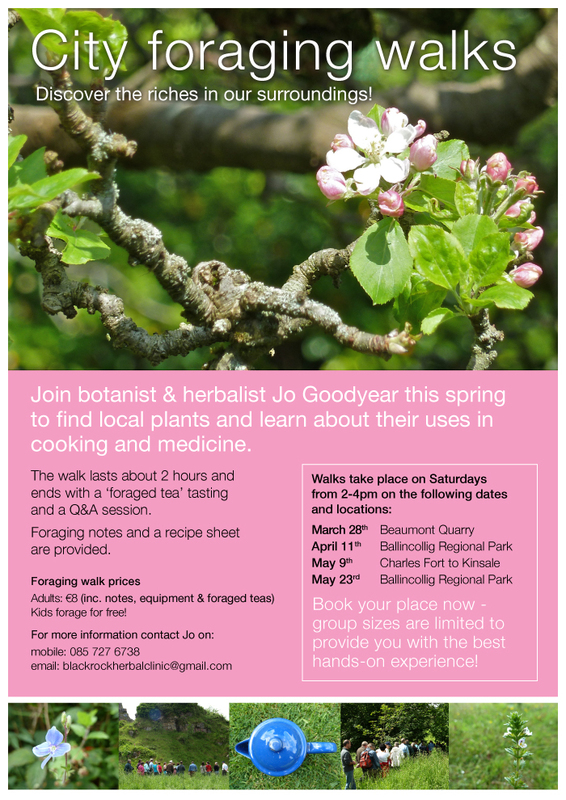 Each session will include a plant walk to meet the plants in person, gaining some information on each herb (how and when to use it) and making simple herbal remedies directly from the plants. 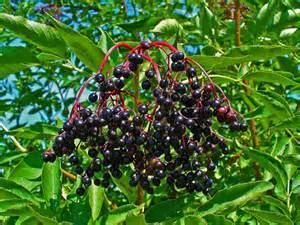 You’ll receive a detailed book and samples of dried herbs and other remedies to take home. Its always s a hands-on fun course with plenty of time for questions and discussion. If you would like to find out more or book a place, get in touch on 0857276738 or blackrockherbalclinic.com. Monday morning class will also run 1030am-1230pm from 19th September, including plant walks in Jo’s herb garden. 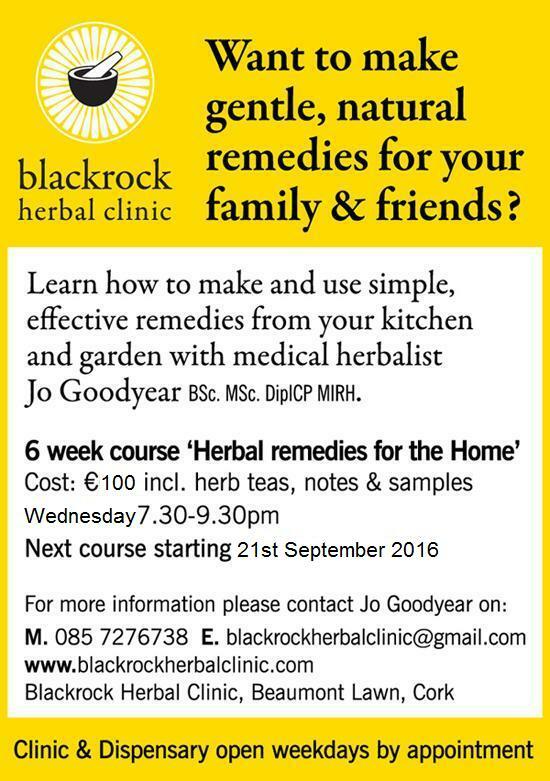 This is a very hands-on course, we will be making recipes and herbal remedies with herbs that you will find in your kitchen cupboards and gardens. Plenty to taste and samples to take away with you every week! Resolved to improve your health in 2016? The same course will run on Wednesday mornings 1030-1230 from February 3rd for 6 weeks, great for catching up if you miss a session! As part of National Herb Week (see www.nationalherbweek.ie for more details), I am hosting an Open Day at Blackrock Herbal Clinic on Tuesday 26th May 10am – 4pm. 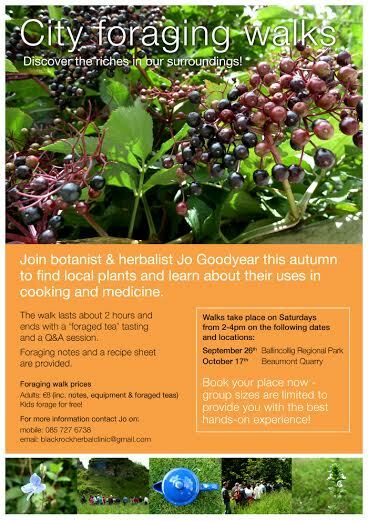 There will be an opportunity to meet the resident herbalist, Jo Goodyear, explore the herb garden and watch some herbal medicines being made. 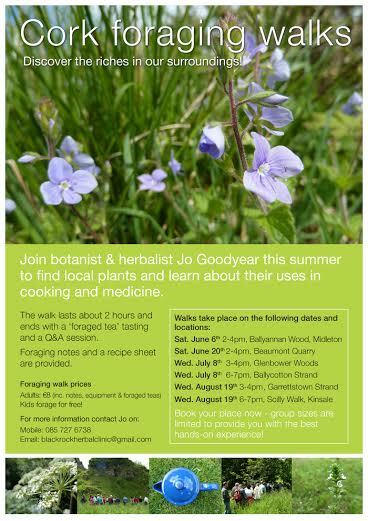 At 7.30pm the same day, Jo will give a FREE talk introducing herbal medicine and demonstrating ways to prepare the herbs you grow or forage into medicines. A chance to explore the edible and medical goodies of coastal Kinsale in this 2 hour walk between Charles Fort and Scilly (plenty of time to stop, ask questions and taste…). Places are filling up, so get in touch if you’d like to join us!